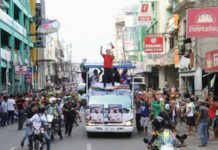 TACLOBAN CITY- The former chief of the Leyte regional prison colony in Abuyog, Leyte, was ambushed by still unidentified suspects just hours after he stepped down from his post during a ceremony on Monday(August 6). 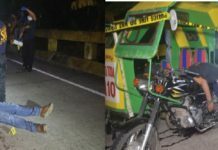 Geraldo Aro, 55, who survived the slay try, was on board a vehicle when he, together with his four companions, were ambushed in Barangay Cadac-an, about 15 kms away from the Leyte Regional Penal Colony at about 12 noon. Three of Aro’s companions reportedly died in the ambush incident. The incident happened just after Aro formally stepped down as chief of the regional penal colony and was on his way to Tacloban City, Supt. Norberto Tuazon, police provincial director for Leyte, said. Aro was replaced by Supt. Danilo Dador as head of the Leyte Regional Penal Colony which is located in Barangay Mahagna, Abuyog. “As of this time, I cannot give you further details regarding the incident as members of our SOCO (scene of the crime operatives) and the Abuyog police are still in the area,” Tuazon, in a phone interview, said. Tuazon also declined to say what could be the motive of the perpetrators as investigation is still ongoing. Aro, who assumed the post as head of the penal facility in 2013, sustained several bullet wounds and was brought to an undisclosed hospital in the city. Three of his companions, one of them a woman, died on the spot. They were on board a Hi-Lux vehicle with plate number SAA-3937. Names of the dead, who were all personnel of the Bureau of Corrections (Bucor) which runs the regional facility, were not disclosed as of this writing. Aro was on his way to the Daniel Z. Romualdez Airport, this city, when the incident happened. He was supposed to take the post as head of the Sablayan Prison and Penal Farm in Sablayan, Mindoro Occidental on orders of Bucor Director Ronald ‘Bato’ de la Rosa.